We're nearly at the end of September which means its 1.) time for your monthly dose of Cucina Conversations and 2.) Cucina Conversations is celebrating its 1st birthday. That's right, at this time a year ago our blogging group was posting its very first recipes for the grape harvest, la vendemmia. I couldn't be happier to be part of this group, and have so enjoyed getting to know my fellow bloggers -- thank you Rosemarie for getting all of this started and being our unofficial group leader! So! Our theme for this month is merende, or snacks, and my selection is pizza bianca alla romana, one of my very favorite snacks ever, neck-in-neck even with my beloved taralli. Pizza bianca, if you're not familiar, isn't exactly pizza as you might imagine it -- its not round, for starters, and there's no sauce, no cheese, and no toppings. It's more of a cross between focaccia and a thick pizza crust, crunchy and golden brown on the bottom and fluffy on the inside, brushed with olive oil and sprinkled with coarse salt before being baked, the very definition of less is more. Its a staple of Roman panifici or forni (shops that sell bread, pizza, and pastries,) a classic mid-morning or afternoon snack for Italian children (a friend of mine once recounted his morning ritual of taking his son to buy pizza bianca for snack at school) and for us adults too. Its superb eaten warm, a few slices wrapped in paper and taken to go, or made a little more substantial filled with a slice or two of mortadella. If you want your pizza bianca for dessert instead of snack, I've also sampled sweet versions filled with Nutella. (Swoon). 1. Heads up, if you're making pizza bianca at home instead of buying it, its not a short process. The dough has to rise overnight in the fridge, meaning you have to start prepping this a day in advance. Having said that, making your own pizza bianca is not at all complicated. Bread making is more about wait than work -- rising isn't a fast process -- and as long as you don't let yourself be intimidated by the lengthy preparation time, there's nothing to it. This recipe is no exception. 2. Now that we've gotten that out of the way, here's the next thing you're probably thinking. Why should you bother to make your own pizza bianca, anyway?! Well, if you're outside Italy you'll be hard-pressed to find it any bakery, so this recipe is a handy dandy way to bring your Italian snack experience to your own kitchen, especially if you've tasted this in Rome and are looking to recreate it (prego). If you're living in Italy and can easily go and buy your pizza bianca, by all means do, but I must say that making your own is a pretty cool experience, from start to finish -- what starts as a bowl of flour and a little yeast magically transforms in to this utterly perfect, utterly addictive pizza bianca. I couldn't have been happier with this recipe -- perfectly crunchy golden bottom contrasting with a cloud-like interior, redolent of olive oil with just enough salt to keep you going back for another piece!-- and suspect you'll feel the same. A couple of notes: If you have a standing mixer with a dough hook, that makes the preparation of this pizza bianca a bit easier, but if you don't, I have provided the instructions below to make it all by hand -- this is what I did, and it worked just fine (after all, people were making bread long before there were Kitchen-Aids). If you want to be super traditional here, you can eat your pizza bianca with a few slices of mortadella, but I prefer to eat this with prosciutto crudo. This is generally best eaten the day its baked, and warm, but I found the few pieces we had left tasted pretty good the next day too. Last but not least, Rosemarie over at Turin Mamma will be preparing amaretti morbidi, or almond cookies. If you are making the pizza bianca by hand, without a standing mixer: in a large bowl, whisk together the flour, sugar, and yeast. Add the water a little at a time, stirring with a wooden spoon as you go, being sure that the water is absorbed before adding more. If you have a standing mixer: After whisking together the dry ingredients as mentioned above, replace the mixing attachment with the dough hook, and add the water a little at a time, again, making sure that the water you've added is fully absorbed before adding more. Next, add the oil, a little at a time, just like you did with the water. If you're doing this by hand, just stir in and incorporate the oil as best you can with a wooden spoon -- it won't be too easy but once you start kneading the dough everything will come together. If you're doing this with a standing mixer, just let the dough hook do its thing until all the olive oil is combined. Add the salt and incorporate as best you can with a wooden spoon, or again with the dough hook. Time to knead the dough -- if you're doing this by hand, turn the dough out on to a clean work surface dusted with a little flour and knead the dough for 15 minutes (sounds like a lot but its not so bad). If you have a standing mixer, use these 15 minutes of kneading to go do something else while your machine does the work. The dough will start out looking like the first photo, and by the end should like shiny and smooth -- half way in you'll notice this start to happen. Next, stretch out the dough into a sort of round rectangle shape. Fold the dough over once, then again, so it looks almost like a wrap. Tuck the sides under themselves and roll the dough in to a ball. Place the dough in a large oiled bowl and cover with plastic wrap. Place the bowl in the oven -- turned off, of course! -- and let the dough rise, undisturbed, for three hours. The dough will rise and double in its volume in this time. Magical! Preheat your oven to 425 degrees Fahrenheit (220 degrees Celsius). Grease a 30x35cm baking sheet with a bit of olive oil. Stretch the dough out onto the baking sheet (this will be easy to do - the dough is very stretchy at this point and holds its shape). Let rise at room temperature for another hour. When the hour is up, drizzle another two or so tablespoons on the pizza bianca, and sprinkle with coarse salt. Bake your pizza bianca for 20 minutes in your preheated oven on the lowest rack of the oven for the first 8 or so minutes (to achieve a crunchy, golden brown bottom) and then move to the middle rack. Keep an eye on your pizza bianca during this time as every oven is different, and its likely yours isn't like mine (lucky you!) Let cool slightly and serve warm. Makes one large pizza, to be eaten probably by only a few people (its very addictive). Blogging, an activity that usually comes to me quite easily, has been difficult lately. For starters, updating a blog twice a week takes a lot of work - the cooking, the photographing, the writing - and lately I struggle to find not only the time but mostly the energy for it. You see, while I'm still working at the same place I've been working the past two years, I was moved to a new division/team a few months ago (not my choice) with new colleagues and completely different type of work, in a very different environment than before. I'll spare you the particulars and simply say that I don't like my new job -- at all -- and miss my old job terribly. I miss my old colleagues (some of my very favorite people) who I don't see as half much as before, I miss the feeling of being delighted to come to work, I miss my old office, my calm, ever-so-positive office mate, and the familiarity of the work. Above all, I miss the lack of stress and anxiety and pressure that is now part of my daily routine. Big sigh. If this all seems a bit dramatic, I apologize -- I didn't intend for this post to turn in to a diary entry, and you can probably tell that I'm writing this at 10pm after a very long day. I know I'm not the first or the last person to have a less than ideal work situation, and despite my current, Eeyore-like gloom, I have enough clarity to see the positives. This job isn't permanent; in the long run it will fall under the category of "learning experience;" it will push me to figure out what the next step is, career-wise, scary as that is; it will teach me to have a tougher skin. (In the short term though? I'm exhausted and I miss where I was working before, in a stamp-my-feet like a frustrated 5 year old kind of way). In the meantime, cooking and baking is, as it always has been, a constant for me, the calm in the storm so to speak, and that brings me to this parmigiana di melanzane, which I methodically prepped and assembled this weekend -- calming work -- and which served me well in leftover form after a long Monday, in all its cheese-filled comfort food splendor. This here version is fantastic, the eggplant thinly sliced and tender and golden brown and not at all greasy, tucked in between layers of tomato sauce, gooey mild mozzarella and sharp Parmesan, with bits of basil here to brighten things up. 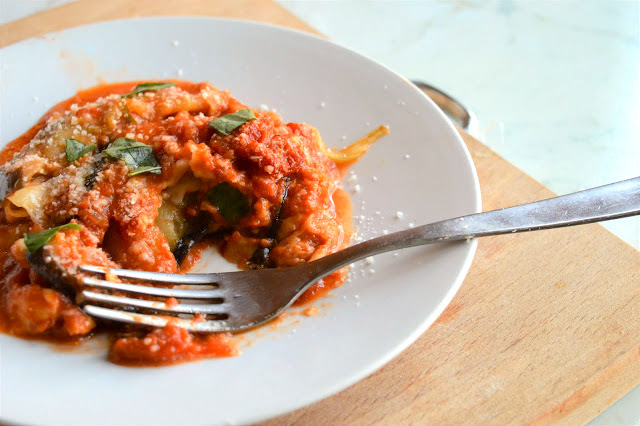 This dish is a good transition between Summer and Fall, too -- full of tomatoes and basil and eggplant, but still cozy and filling and baked in the oven, the kind of food that softens the edges of a bad day. 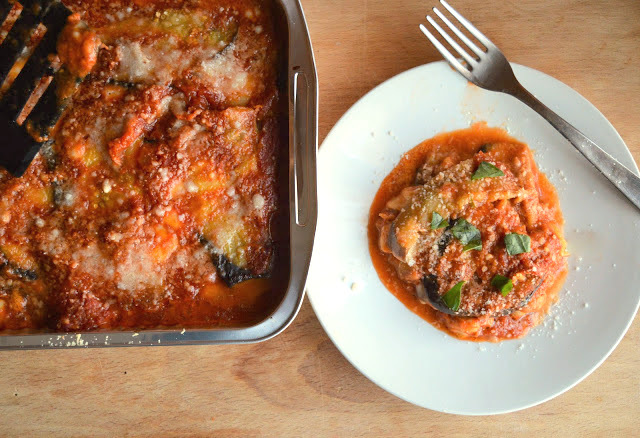 A couple of notes: My research showed me that there are lots of different ways to make parmigiana di melanzane; certain recipes ask you to dip the eggplant in flour, or flour and egg, while others leave the eggplant as is; some recipes call for fiordilatte or provolone or caciocavallo instead of mozzarella; for the sauce, some recipes call for crushed tomatoes instead of whole tomatoes, and leave out the onion, or include garlic; some versions of this dish are made even more substantial with the addition of prosciutto or hard boiled eggs. I took what I liked best and came up with this version, but feel free to use mine as a suggestion and play around with it. If you want really uniform slices of eggplant, feel free to cut it with a mandolin, but I cut mine by hand. Don't worry about all the pieces being the same, as you'll find yourself constructing the layers in a kind of puzzle way where you put what piece fits best. Finally, I wouldn't recommend trying to use mozzarella di bufala here as it has too much moisture -- cows milk mozzarella is best. If you use fiordilatte, which has a bit more moisture, make sure you drain it well first and then pat it dry. Looking for other recipes with eggplant? I've got this Pasta con pesce spada e melanzane, these Polpette di melanzane, and this Rigatoni alle melanzane. Cut the leafy tops off the eggplant and discard. Peel the eggplant using a sharp knife. Cut the lengthwise eggplant in to uniformly thin slices, about 2 or 3 millimeters thick. Lay the eggplant out on some paper towels, sprinkle all the pieces with a bit of salt, and set aside for about half an hour. In the half hour while the eggplants are hanging out, prepare the tomato sauce for the dish. Put a bit of olive oil in a large pot and saute the chopped onion until soft. Add the tomatoes to the pot, and let the sauce cook, covered, stirring occasionally on low heat for about half an hour. Once your sauce is started, get back to your eggplant. Wipe the water that has been drawn out of the eggplant by the salt with more paper towels. Heat some vegetable oil in a pan with high sides -- it should be enough vegetable oil to cover the eggplant fully. When the oil is hot (170 degrees Celsius if you have a thermometer), fry the eggplant a couple of slices at a time until lightly browned and softened, about 3-4 minutes. Let the eggplant drain on a paper towel lined plate or a a plate lined with wax paper. Repeat until all the eggplant is fried. This might take about 30-40 minutes as you don't want to fry too many slices at a time -- I'd say max 4 slices. (But this is good for clearing the head). Time to assemble! Preheat the oven to 400 degrees Fahrenheit (200 degrees Celsius) Take your baking pan and start with a thin layer of tomato sauce at the bottom. Next, top the sauce with a layer of fried eggplant, then another layer of sauce, then Parmesan and some of the mozzarella and then basil. Repeat again: eggplant, sauce, Parmesan, mozzarella, basil and continue this way until you've got your last few slices of eggplant for the last layer. The last layer should be eggplant and Parmesan. You may not use all the Parmesan, and if this is the case, keep it and use it for serving. Bake the parmigiana di melanzane in your preheated oven for 30-35 minutes, or until the cheese is melted and the Parmesan on the top is lightly browned. If you have a broiler (or grill, for the Brits) feel free to broil the parmigiana di melanzane on the last 5 minutes of cooking to get a nice Parmesan crust. Let cool a bit before serving. Serves 4-6. I had a lot of ideas about where I wanted to focus today's post about this Lemon Roasted Chicken. I thought about angling it towards the author of this recipe, Lidia Bastianich, Italian immigrant turned celebrity chef, a renowned cookbook author, TV host, and owner of 4 restaurants in New York City. I toyed with the idea of making this a nostalgic post -- my mom made us lots of roast chicken and potatoes and similarly cozy meals growing up -- but I already got all nostalgic on you last week when I reminisced about these blondies. Then, I had it -- the focus would be Fall comfort food, now that we've put away the basil and tomatoes and turned our sights towards apple and pumpkin and soup, not to mention lately I come home at the end of the day at my newish and stressful-ish job craving comforting fare just like this chicken. So after a bit of contemplation, of starting this post and discarding ideas and then starting over, it came to me: a recipe this classic and this straightforward doesn't need a story or an explanation or a song and dance to describe it. Roast chicken is the definition of simple, to the point, no nonsense, just plain good. So, I'll cut to the chase -- this recipe is good. More than good, it’s great, delicious, a perfect roast chicken with ultra-crispy skin and juicy meat, a hint of sunshine-y lemon and cozy rosemary, surrounded by sweet roasted onions and basted with a white wine pan sauce, Lidia’s slightly Italian touch. The whole thing comes together quickly, too, just a matter of putting the chicken in a pan with a few other ingredients and letting them all hang out in the oven for a bit, and voila, dinner is served. And I know I said I had already gotten nostalgic on you last week, but food is very nostalgic for me, so indulge me here: as this chicken was roasting my whole house smelled like white wine and rosemary, two scents I associate with my nonno's (grandfather’s)house growing up. He was always cooking something when we came in the door. A couple of notes: In her instructions below, Lidia specifies cutting the onions in such a way that they're kept together at the root end -- I suspect this is because if they're not attached at the end, they break in to individual rings and the pieces are too thin and thus risk burning in the oven, so try and do your best to keep the onions cut the way she advises. Be sure to use un-zested lemons to roast in the pan and put in the cavity of the chicken; the zested ones will result in a bitter pan sauce as the white part of the lemon (the pith) will be exposed and that has a very bitter flavor -- therefore I recommend you buy two more lemons in addition to the ones that Lidia asks for. I halved this recipe and used a smaller chicken as I was cooking for just two people (if the chicken in the photos seems small, that's why). This would also be good served with mashed potatoes or roasted carrots in addition to the suggested roasted potatoes. Looking for other chicken recipes? I've got this Pollo alla cacciatora in bianco, this Pollo ai peperoni, these Cotolette di pollo. For few more cozy recipes as we head in to Fall, I've got this Polpettone al forno, this Chickpea, Sausage, and Kale Soup, this Butternut Squash Risotto, and this Risotto with Pancetta and Peas, this Pici with Sausage Ragu', this Pappardelle with Pumpkin and Porcini, and these Savory Squash Pancakes with Sage Brown Butter. Preheat the oven to 375 degrees Celsius. Zest two of the four lemons and set the lemon zest aside. Gently slide your fingers under the skin of the chicken to loosen it. Spread the grated lemon zest under the skin, then sprinkle the chicken with 1 teaspoon salt, and rub it all over with 2 tablespoons olive oil. Cut the remaining two lemons in to quarters and add them to the roasting pan along with the onions. Toss the lemons and onions with the remaining 1/2 teaspoon salt and 2 tablespoons of olive oil. Place some of the lemon quarters in the chicken cavity, along with the sprigs of rosemary. Set the chicken on the onions and remaining lemons and tie the legs together with kitchen twine so the chicken holds its shape as it roasts. Pour the wine in to the pan. Your chicken is now ready to roast. Place the chicken in the preheated oven and let it roast, basting once or twice with the pan juices, until the meat between the thigh and breast reaches 165 degrees on a meat thermometer and the skin is crispy and golden, about 1 hour and 20 minutes. Remove the chicken to a cutting board, and let it rest for 10 minutes. Transfer the chicken, lemon, and onions to a serving platter, drizzle with some of the pan juices, and eat while hot, ideally accompanied by roast potatoes. Serves 4. Though I finished elementary school all the way back in 2001 and graduated high school a decade ago, I still associate the month of September with the ever-so-dreaded back-to-school. Don't get me wrong here -- I liked school well enough -- but with its early hours, homework, and test, school never stood a chance against Summer vacation, with its sunshine and ice cream and days at the beach. When I was younger, I remember rolling my eyes at August's abundant back-to-school commercials, turning up my nose at my newly ordered and supremely uncomfortable elementary Catholic school uniform, and feeling downright betrayed when I realized the sun was going down a bit sooner. Though I can't remember the last time I completed a homework assignment, the remnants of the old back-to-school feelings are still there -- this morning, I threw a sympathetic look at a group of tired looking backpacked Italian teenagers waiting for the train, smug in the knowledge that my studying days are behind me. That being said, back-to-school meant lunch in the cafeteria, and lunch in the cafeteria meant one thing: blondies. If you're not familiar, a blondie is, well, the blonde equivalent of a brownie, a treat that is rich and butterscotch-y in the same way that a brownie is chocolate-y and fudge-y, made with lots of brown sugar and butter instead of cocoa powder and chocolate. My mom made them for us kids every Fall -- this recipe here -- tucking them in to our lunchboxes where they were coveted among our classmates at lunchtime (we could never be convinced to trade them, though, not even for a Twix bar). Nothing could make us forget the sunshine-y days of summer quite like a blondie, and to this day they're among the most nostalgic foods I know. I've grown up a little since my cafeteria days though, and so I give you these Coffee Chocolate Chip Blondies, an updated version of my favorite childhood treat. They are, as the name suggests, made with coffee, something my younger self wrinkled her nose at and that I didn't start drinking until well in to my 20s. In the place of my once preferred super sweet milk chocolate, there's semi-sweet chocolate (the chocolate of more adult taste buds) and dark chocolate covered coffee beans, both of which provide a bitterness balances the sweet butterscotch-y flavor of the blondies perfectly. These are blondies, but a bit more mature, blondies that you want on hand to get through a break-up or writing a masters thesis, blondies to celebrate a promotion or an anniversary. Or just to eat in your pajamas while binge-watching something on Netflix. Grown up stuff. A couple of notes: You can use either chocolate chips or chocolate chunks here; I used chocolate chunks. I also threw in a handful of chocolate covered coffee beans that I bought in Budapest, and recommend you do the same, if you can find them -- it makes the blondies all the more coffee-ish. I used dark brown sugar but I suspect light brown would work well here too. These look more like brownies than blondies in the photos, but that's because the coffee makes them a little darker than your usual blondie. Looking for more coffee-ish desserts? I've got this Cappuccino Cake and this Coffee Nutella Cake. Looking for more bars and brownies? I've got these classic Blondies, these Fudge Brownies, these Cheesecake Brownies, these S'more Bars, these Dulce de Leche Brownies, these Pecan Pie Bars, these Dark Chocolate Gingerbread Bars, Blueberry Pie Bars, and these Lemon Squares. Preheat the oven to 350 degrees Fahrenheit. Grease a 9x13-inch baking dish with butter and set aside. Stir together the flour and baking powder in a medium bowl and set this aside too. In a medium saucepan over medium heat, combine the butter, sugar and salt. Cook, stirring often, until the butter is completely melted and the mixture is hot but not simmering. Remove from the heat and stir in the coffee until well combined (if the mixture refuses to come together, let it cool for a minute or two and try again). Let the mixture cool to room temperature, about 15 to 20 minutes. Once the butter and sugar mixture has cooled to room temperature, add the egg and vanilla and whisk until combined. Transfer the mixture to a large bowl. Add the flour mixture and stir just until combined. Add the chocolate chips and stir gently to combine. Using a spatula, spread the batter evenly into the prepared pan. Bake for 18 to 24 minutes, until the blondies are set on the edges and the top is golden brown and just beginning to form cracks. A toothpick inserted into the blondies should come out with just a couple of crumbs. Transfer the pan to a wire rack and let it cool completely. Grab opposite corners of the parchment paper and gently lift the blondies from the pan onto a flat surface. Cut them into squares (big or small, up to you) and serve. No sooner had I tasted it, I wrote to every culinarily-inclined friend I knew to tell them about this absolutely genius sauce that was one of the best things I had ever made in my life and was also so superbly easy to make and where were they right now because if they were in their kitchens they should make this, asap, and thank me later (!!!) (My mother actually took me up on this offer and this is what my dad had for dinner that night). Next time you see your sister, I want you to give her a big hug, tell her you love her, then give her something expensive. Because that sauce was outstanding. Its pretty famous outside of my own kitchen, too. This sauce is so very good that its been written about in the cooking section of The New York Times, plus its been featured on the most important foodie websites and blogs like The Kitchn, Food52, Epicurious, and my very favorite, Smitten Kitchen. When I recently posted a preview picture on Pancakes and Biscotti's social media -- just a picture of the three ingredients, no further explanation -- someone commented "MARCELLA SAUCE!" and another "Marcella Hazan!!!" Indeed, if this sauce were a person it would be a celebrity of Angelina Jolie levels, constantly dodging the paparazzi and leaving the house in face-obscuring Chanel sunglasses. The brains behind this recipe is of course Marcella Hazan, who is credited with bringing traditional Italian cuisine and techniques to the U.S, similar to the way that Julia Child brought French cuisine to the States. Marcella was born in Cesenatico, Italy (in the Emilia-Romagna region) and moved to New York City in 1955 after marrying Italian-born, New York raised Victor Hazan. She wasn't much of a cook before she reached the U.S -- her mother and grandmother had always done the cooking -- but once a newlywed in New York City with a husband to feed she began to cook herself, using cookbooks from Italy and recollections of her mother's food to get started. She got the hang of the cooking thing, and eventually she went on to offer cooking classes in her own kitchen before then opening her very own cooking school. She published 7 cookbooks on traditional Italian cuisine in her culinary career, all of which were written in her native Italian and translated in to English by her husband. She is still considered one of the very foremost authorities on Italian cuisine in the U.S., and I can't thank her enough for this sauce. I'm at the end of this post now and have been so busy recounting my enthusiasm and the background behind this Tomato, Butter, and Onion sauce that I haven't even explained why. Told you I had a lot to say about this recipe. So: this sauce is genius, both for its simplicity and ease but also its incredible depth of flavor. The onion here infuses the tomatoes with a subtle sweetness, and the butter rounds off and softens their usual acidity, all the while giving the whole thing an incredible richness. This is a tomato sauce that manages to be downright luxurious, not an adjective one usually associates with a simple tomato sauce, but this one seems to break the mold. Plus: there are no carrots or celery or onions to chop, nor is there any bay leaf or herbs to buy, or wine to uncork. This sauce is the true definition of "less is more," and in this case, so very much more. A couple of notes: I suppose if you really wanted to you could add a bit of basil to this sauce, but honestly, you don't really have to. Other than that I can't say I have any comments really -- this sauce is that foolproof. Looking for other tomato-y recipes? I've got this Spaghetti with Cherry Tomatoes, this Cherry Tomato Cobbler, these Savory Tomato Shortcakes, these Rice-Stuffed Tomatoes with Potatoes, and this Cherry Tomato Crostata. Peel the onion and cut it in half. Place the tomatoes, unsalted butter, onion halves, and a pinch of salt in a medium pot over medium heat and let the mixture come to a bubble. Lower the heat and the let the sauce simmer for 45 minutes, breaking up the tomatoes as you go and stirring occasionally to make sure the sauce doesn't burn or stick on the bottom of the pot. When the 45 minutes are up, take the sauce off the heat and discard the onion. Taste the sauce and add salt if necessary. Makes enough sauce for about 1 pound (448 grams) of pasta. Be sure to serve the pasta topped with lots of freshly grated Parmesan cheese. I've made cheesecakes, layer cakes, and cupcakes for this blog, more "every day" cakes than I can count, plus (pan)cakes and muffins -- which, lets face it, are essentially just naked cupcakes - but strangely I've never gotten around to making an upside-down cake. I apologize for the delay. Let me explain. The upside-down cake, specifically the pineapple upside-down cake, is an American classic, a dessert that can be traced all the way back to the 1920s when canned pineapple in conveniently cut rings started appearing on supermarket shelves and housewives started sticking them on top of cake. Now -- while I am all for retro desserts that have stood the test of time, like the Baked Alaska (an ice cream cake topped with meringue cake that goes in the oven and defies all logic) and the Banana Split (what's not to love?!) the pineapple upside down cake, with its creepy circles of canned pineapple over the top, equally suspicious maraschino cherries, and syrupy topping paired with already sugary fruit has never appealed. It's nothing personal -- its just not my thing, and its staying power is a mystery to me. It's not you, its me, pineapple upside-down cake, I would say, if it ever asked. But this is an upside-down cake I do like, one made with fresh sweet plums, at their peak this time of year, tucked in to a honey tinged, butterscotch topping and flipped over on to a tender cinnamon-y cake that takes in all the lovely plum juices. This is the pineapple upside-down cake, updated and made over, the late Summer version of the tart tatin, the upside-down cake's French cousin, and also a perfectly delicious cake in its own right. And while we're all here talking about cake -- a slice of this topped with a scoop of vanilla ice cream or a dollop of fresh whipped cream wouldn't be a bad idea, either, not at all. A couple of notes: You could easily substitute nectarines, peaches, or even apples for the plums here. I baked my cake in a springform pan instead of a round cake pan and that worked fine, though I did have to keep a bit of foil under the cake to catch the bit of caramel/plum juice that leaked out of the sides where the ring of the pan and the bottom meet. I ended up using less than six plums to fill the top of the cake, but let me know how you do -- in hindsight I could've probably fit more fruit on the top. Finally, I accidentally used one teaspoon of baking powder instead of the recommended two, and this worked out just fine in the end -- just keep in mind if you follow the directions your cake will be a little higher than mine looks in the photos. Looking for other sweets made with fruit like this one? I've got this Plum Cobbler with Cinnamon Biscuits, this White Chocolate Blueberry Cake, these Raspberry Ricotta Scones, this Best Ever Apple Cake, this Blueberry Crumble Pie, this Peach Cobbler, this Peach Raspberry Buckle, this Apple Crisp, this Ricotta Pound cake with Strawberries, and this All-American Apple Pie. Preheat the oven to 350°. Cut up the plums into thin slices -- to do this, I cut a line all around the plum and then twist the two halves, kind of like its an avocado, and then remove the pit and cut each half up. Very lightly butter the bottom of the cake pan (this probably isn't even completely necessary, but I do it anyways and my cake never sticks to the pan). In a small saucepan, combine the brown sugar, honey, and six tablespoons of butter and whisk together over medium-low heat, letting the mixture come to a simmer. Let simmer until the mixture becomes bubbly and syrupy, then pour into the bottom of your cake pan. Carefully arrange the plum wedges in the brown sugar mixture in concentric circles and set aside. Whisk together the flour, salt, baking powder, and cinnamon in a medium bowl, and set aside. In a large bowl, beat together the butter and sugar until light and fluffy, then add the eggs one at a time. Beat in the vanilla. Next, whisk the dry ingredients in to the butter mixture, alternating with the milk. You should do flour mixture, milk, flour mixture, milk, flour mixture. Pour this batter over the plums and smooth out with a spoon or offset spatula so the plums are completely covered. Bake the cake in the center of the oven for 55 to 60 minutes, until golden and springy. Use a knife to cut around the cake to try and separate it a bit from the sides of the cake pan. Let cool in the pan on a rack for 30 minutes, then invert the cake on to a serving plate. Let sit for 5 minutes, then remove the pan and admire how lovely your plum upside-down cake looks. Cut into wedges and serve warm or at room temperature with whipped cream, ice cream, or powdered sugar. Serves about 10. Recipe barely adapted from www.epicurious.com.